All of Gibsonton and Riverview and a few other parts of South County have a resource for food, clothing and household items of which many are unaware. Anyone living within one of 14 specific ZIP codes can be served by Emergency Care Help Organization, or ECHO, a helper agency based at 507 N. Parsons Ave. in a building shared with the Brandon Outreach Clinic. ECHO of Brandon provides immediate relief in the form of food, clothing and household items to those who have suffered recent hardships. The Brandon Outreach Clinic helps people who have no insurance, are underinsured or are just plain medically needy. But Collins wasn’t giving her talk about the Brandon Outreach Center. 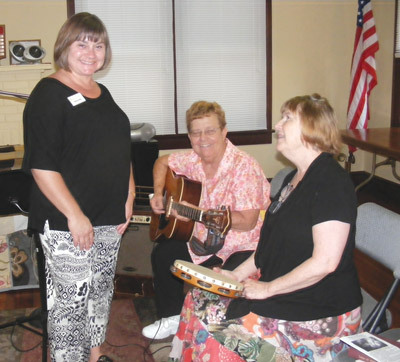 She was at Unity of Brandon on Sunday, June 29, to tell the fellowship about ECHO and how members can help. Part of Collins’ job is to go to religious and civic organizations and make them aware of ECHO’s services and the people in the surrounding communities who need them. “ECHO provides immediate relief with food, clothing and household items to people who have suffered a recent hardship, like losing a job, a breadwinner in the family, or moving because of domestic abuse. In the case of a fire, a fire report filled out by the Fire Department is necessary, but in that case the recipient may receive items needed to set up housekeeping again, including cookware, towels and sheets. The organization has been serving the area for 25 years and has recently added some ZIP codes to its list. ECHO has recently forged a partnership with Feeding America that allows ECHO to buy food at 18 cents a pound. They also have obtained use of refrigerated storage areas so they can offer fresh produce, meat and fish. “We’ve found that, generally, the poor eat badly because they don’t have access to the proper foods,” Collins said. Most people donate non-perishable canned goods, pastas and other highly processed boxed foods. But the partnership with Feeding America has allowed for much healthier items. ECHO also has formed a partnership with The Hunger Project, which became well-known years ago through Dionne Warwick’s famous rendition of That’s What Friends Are For and the group performance of We are the World. The Children’s Board and the Florida Literary Coalition have enabled ECHO to also offer some classes to the community, including those on Healthy Living, pregnancy and how to earn a free GED. Grants from large companies, like Walmart, enable people to get vouchers for the foods they wish to buy. “They have been getting fruit and vegetables from Collins Produce (no relation) and from two community gardens, one at Winthrop, and the other at Baylife,” she said. Because of the relationship ECHO has formed with Feeding America, it is also able to obtain meat, fish and dairy products, including milk, eggs and margarine. Government seafood inspectors donate boxes of fish that have been opened for inspection. Regulations prohibit them from being sold once opened. ECHO does not give financial help to people but serves as a referral center to other organizations, some of which do provide cash under certain circumstances. People who are receiving help from food stamps, SNAP, Medicaid and other state and federal programs may also get help during times of emergency at ECHO. “Sometimes there’s an emergency, and that’s when we’re there to help,” Collins said. Unlike many agencies that cannot help individuals and families if they are already receiving help elsewhere, ECHO is different. More than 16,000 area residents a year are served by the organization. Assistance during a lifetime is limited to four times, with six months between visits. But there is no limit on the education assistance, which includes GED, Healthy Living, Mommy & Me, Basic Computer Literacy and Resumé Writing. If people want to help, there are many ways they can do so, Collins said. Houses of worship, civic organizations and neighborhood groups can collect specific things, like children’s clothing, socks, shoes or underwear. If they make their forthcoming donation known — especially around the time of the holidays — then everything gets covered and nobody gets left out. “Like at Thanksgiving or Christmas, one group can collect cranberry sauce, and another can give beans,” she said. ECHO is located at 507 N. Parsons Ave. (north of S.R. 60) and shares a building with the Brandon Outreach Clinic, which helps people with medical expenses when they lack the money to pay, are underinsured or have no health insurance. 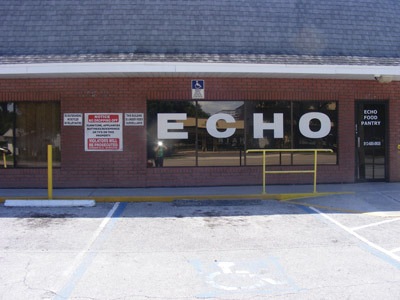 The building ECHO uses as its base of operations is leased from Hillsborough County at $1 a year, and that fee is for both ECHO and the Outreach Clinic. Gift of Hope and the Children’s Board and many others give financial support. Anyone who wants to help may visit www.echofl.org or call 813-685-0935. Collins is personally available at kathy@EchoFL.org. ZIP codes covered by ECHO: 33510, 33511, 33527, 33534, 33547, 33569, 33578, 33579, 33584, 33592, 33594, 33596, 33610 and 33619. All applicants must be 18 or older.